Tailbone is the fourth of the Fossil Lords, but by no means the least, for is not the tail the most important part of the animal? It will come as no surprise to learn that he forms the tail of the combined mode, but the figure itself holds some surprises - one of which I learned while writing this very article! Tailbone is one of the smaller of the Fossil Lords, along with Jawbone. He's a lot squatter than Tailbone and Ribcage, and far less gangly, being a more traditional 'chunky' figure. He's a solid light blue, but there's a welcome use of silver on the vents beside his head to give him a bit more visual interest. Of note, the tail connector piece on his back is a painted die-cast strip. 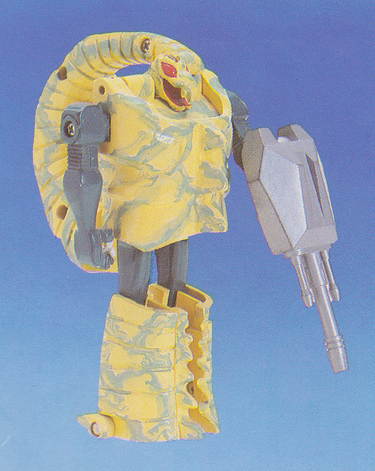 The other Fossil Lords featured unpainted die-cast, so it is good to see that the designers were still willing to paint the metal where needed (in this case, to stop the alternate mode from having a silver stripe down its back). His most obvious feature is his tail. I had spent time writing how his tail dangles from his back, but just discovered a step in his transformation that the instructions don't make clear - the die-cast strip pushes up into his back, hoisting the tail up and locking it in place. It's amazing how there are always new things to discover in the world of Rock Lords! His articulation is limited for a Rock Lords, but not for a figure of the period - his arms will move up and down, he has knee joints (but not hips) and his head can tilt up and down. The head tilt is nice, and he feels solid overall. Tailbone's prototype looks very similar to the final product on first glance. He's missing the vents beside his shoulders and his gun is close to the released version, just without the fins on the back. The prototype has two advantages - it has fold-out heels (these are present on the final one, but molded in place) and the arms are different, having a hinge that allows them to fold backwards and so be hidden when he transforms. The arms on the final version are fixed in place. His gun is smaller than most of the Fossil Lord weapons, on a par with Jawbones, and is much more suited to his scale than some of the other massive guns! It looks nice in his hand, and helps to break up the solid blue of his body, the gold being a nice contrast with the silver of his humanoid mode. Tailbone's transformation is both simple and utterly terrifying. Simple in that he simply folds up his chest panel and swings around the legs and tail (no surprises at all) and terrifying in that the chest panel hooks on extremely tightly to the arms. Thankfully the plastic is really thick, or this would most likely be a common broken part! In his tail mode, tailbone is... certainly a tail! Or at least a tail with a dangling connector port! It's here that we really get the 'Oh god the budget ran out' effect, as unlike the prototype, there is no way to hide the arms, and the heels do not fold in and are very visible. Being a uniform colour helps him in this respect, as it does make these issues slightly less obvious than they need to be. It's a big chunky tail but on its own is underwhelming. Tailbone is a limited figure, and seems to have got the tail-end (pun intended) of the figure's design budget. He's a lot simpler and more basic than the other figures, and just does what he needs to do - ie turn into a tail. Yes, he has his issues (especially that the arms go nowhere when he transforms) but there something about his chunkiness that makes me prefer him to some of the more complex Fossil Lords.